A box full of sky | carpe diem! I’m going to make something based on Susette’s p-chullo pattern, a simply beautiful hat available free on Ravelry and from her blog, Knitting Letters: A to Z. If you’ve never heard of it, go and read the first entry now, then savour the rest slowly. I ration myself to one per week as I re-read them. The pattern requires 10 colours; I’m going to work from a photograph, as I did for ‘Hellebore’. This photo. Let’s see, what else can I show off? I love to post pictures of a shawl blocking, but you’ll have to settle for Aeolian on the needles ready to bind off. 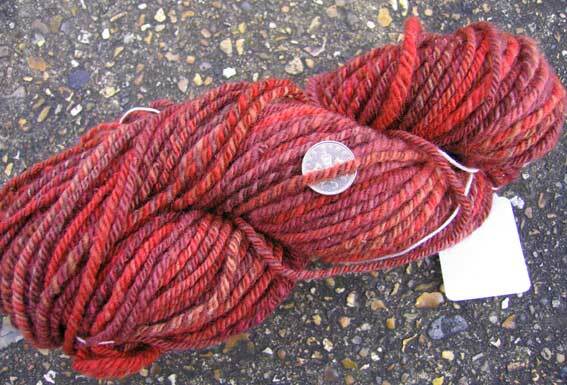 Once again I CANNOT get the photo to do justice to the yarn. 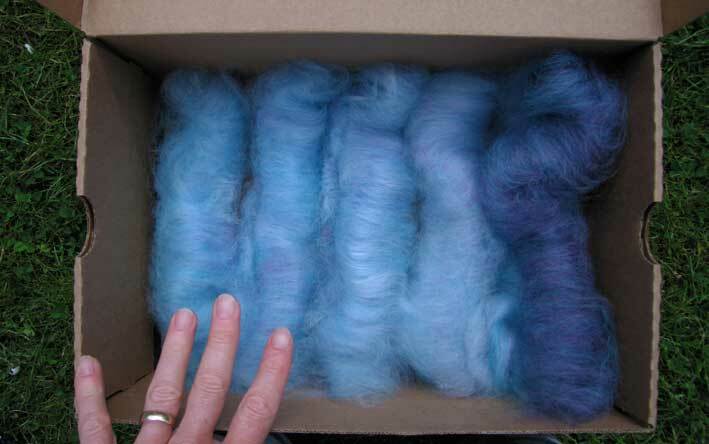 That’s Blue Moon Fiber Arts silk thread II in Rook-y, and it’s simply, utterly gorgeous. 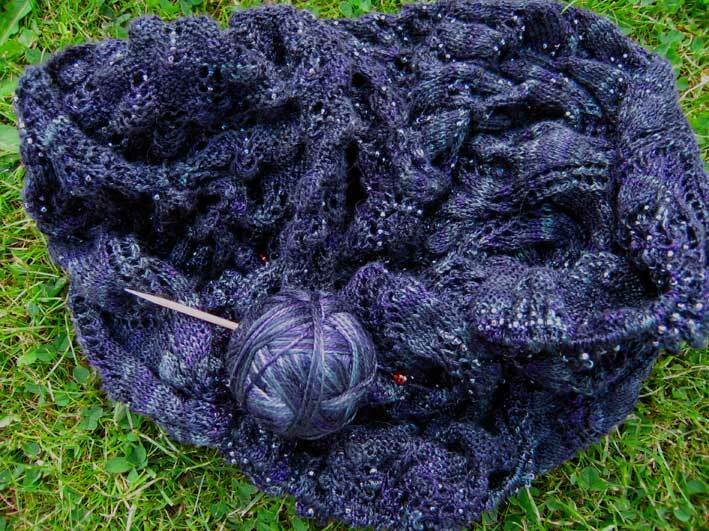 The Raven Clan colours are striking on wool, but on silk they’re beyond beautiful. The shawl pattern is great fun, but I have serious reservations about the beads. There are a LOT of beads on this. The shawl is so heavy that I’ve wondered whether a heavily beaded shawl, say one with a border of real silver beads, could be used as a lethal weapon. Swing this thing by one corner and the entire length would wrap tightly around someone else’s throat like a bolas. Beading it added at least a third to the time needed to knit it and… I’m almost certain I don’t like it. Just too much glitter. So I’ll bind it off tonight, block it tomorrow and I might just attack it with a hammer on Tuesday. Beads are glass. In a contest with a hammer, they’ll lose. No photos of any walks, though. Of course there have been walks! We broke out the big packs a fortnight ago for 13 miles there-and-back on the Monsal Trail, along the Wye in Derbyshire. Last weekend we took my sister and her husband to Ashopton and walked about 12 miles along Derwent Edge. Next weekend… who knows? But it’s no wonder I’ve had difficulty finding spare afternoons for the Rampton Project. Especially as there has been spinning. Hullo, my name is Sarah, I have a problem… and I love it! 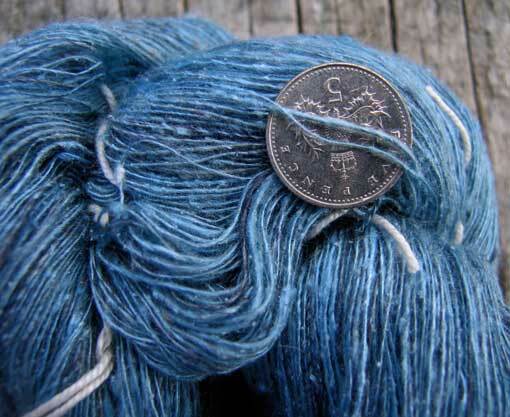 This is 640m of noiled silk singles, spun from Gnomespun‘s Surprise Sapphire (a custom blend). Dan’s got a really good eye for colour. 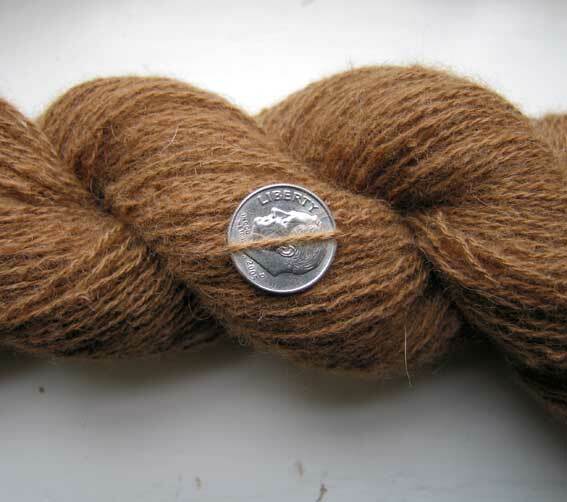 This wanted to be a weaving yarn, so it’s gone to Lynn. 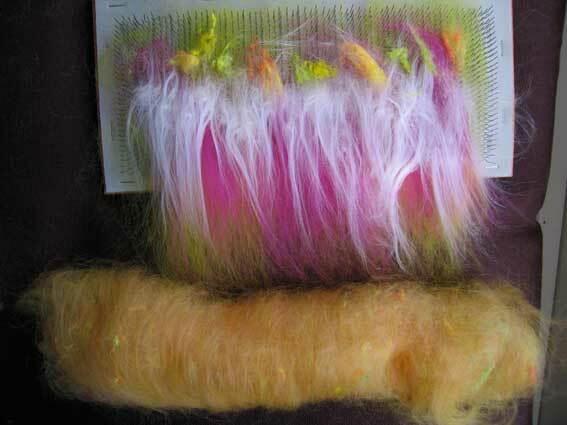 What else… this is 88m of 3-ply ‘Jackaroo’, ‘Come in Spinner’ dyed Polwarth from the Socktopus Fibre Academy Club. I’ve decided this club will be an opportunity to challenge myself by spinning outside my comfort zone; for this I wanted something bouncy and warm and significantly thicker than my usual lace singles. I think there’s enough to make a hat to replace the one I lost on Derwent Edge a month or so back. There’s more, but I have to go and deal with the hamburglar* buns for dinner tonight. Lesson for today: if you alternate making bread and making rolags, you might be able to avoid bits of dough in the rolags, but you will not be able to avoid bits of rolag in the dough. I picked the big lumps out, maybe he won’t be able to distinguish the rest from the usual cat hair. A final thought. If you like being active outdoors, if you climb or ski or dream of whitewater kayaking, there’s a podcast for you at The Dirtbag Diaries. Good stories, well told, with well-chosen music and silence, as appropriate. This entry was posted in Uncategorized on April 26, 2009 by sarahw. I love it when you say ‘Bother.’ Also, it is entirely too bad there’s an ocean between it – it would be so much fun to play with you! **snerk** Re: food and cat hair, I have decided that when I get around to designing labels for my homebrew, I’ll be the “hair of the dog” brewery. After all, if there’s an inevitable ingredient, you may as well advertise it in advance, right…? P.S. my verification word is ‘haliga’. I think this should be a middle-eastern flatbread delicacy invovling olive oil, houmous, olives and…? 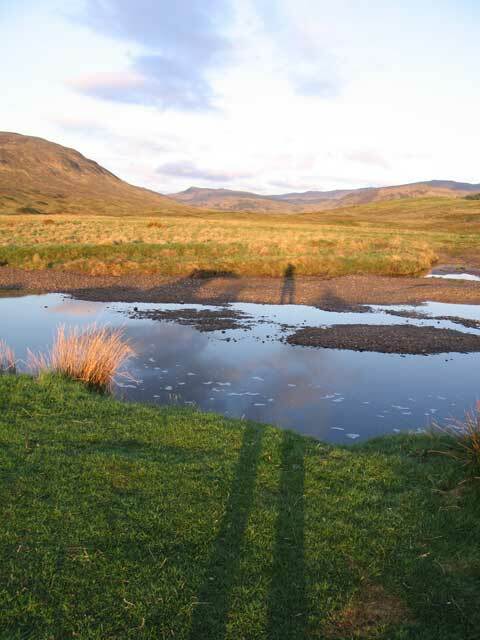 What a gorgeous self-portrait with landscape! Very surreal & elegant. I can't wait to see how the chullo comes out. Thanks so much for your kind words & I hope you won't mind if I follow your progress on ravelry. I too love that p-chullo pattern and will hang around your blog with interest. 16miles in 6 hours – awesome! – I’m a dawdler in comparison.